The LDS have microfilmed a large number of manuscripts from the War Archive in Vienna. The manuscripts of the Grundbuchblätter Diverse for personnel from Bohemia, Moravia, and Silesia were included in these microfilmed records. These rolls of microfilm are a good source for Czech military records. The Grundbuchblätter Diverse: Böhmen, Mähren, Schlesien are the military foundation registers for Austrian army personnel from Bohemia, Moravia, and Silesia. They include soldiers born approximately 1820-1864, some earlier. Data shown includes year of birth, place of birth, a personal description, and record of service. These records are reproduced on 665 rolls of 16mm microfilm and are divided into two series: Diverse (454 rolls) and Diverse/I (211 rolls). Copies of these rolls of microfilm can be borrowed through a local Family History Center for a nominal fee. Both series are strictly alphabetical by surname and given name. It's necessary to check for all possible spellings of the names. For example, if your ancestor's name was Jan Sedy, you need to check for Jan, Johann & Joannes and Sedy as well as Schedy. Since the Grundbuchblätter Diverse is arranged alphabetically, it's not necessary to know the regiment in which your ancestor served. 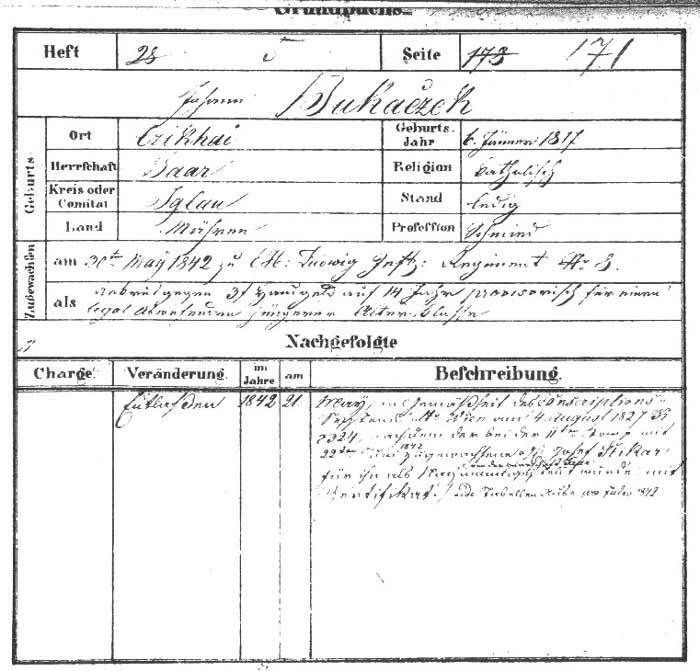 This is an example of a record from the Grundbuchblätter Diverse for Johann Bukaczek. In addition to information about his military service, it lists his date & place of birth, religious denomination, marital status, and profession.